ALDLAND celebrated tax day this year by taking a dive into the numbers behind the Detroit Tigers’ offensive production. Since last season, I had developed the feeling that this should-be offensive power was having trouble scoring late in games, hamstringing their ability to mount comebacks and generally secure a win in the later innings, and I wanted to investigate to see whether that really was the case. If anything, the effect has become more pronounced. 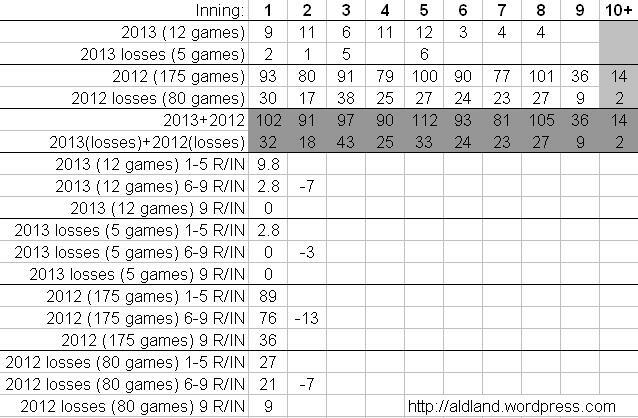 Focus on the differential in R/IN (runs per inning totals to this point). Right now, the Tigers have scored thirty more runs in the first five innings of games than they have in the last four, or about a forty-five percent reduction. It’s an eight run difference when looking only at losses, but the ratio, forty-eight percent, is similar. Yes, this compares five innings of data to four, and sometimes the ninth inning isn’t played, but those caveats apply to both the early season data and last season’s, where the late-game falloff (-13/15% and -7/22%) was far less significant. Acknowledging some constructive criticism I received the last time I presented this data, I agree that merely breaking out losses may not precisely indicate that the Tigers were unable to mount a comeback, since they obviously weren’t able to in those games, but I do think that highlighting losses was a valid pre-collection decision, because doing so might have shown that a dearth of late-inning scoring was a particular problem that contributed to the team losing. Without deeper analysis, I do not think the above numbers, as currently presented, support that notion, however. The dropoff appears to be similar across all games. A secondary observation from this data is that the Tigers are on pace to score many more runs overall this year than they did last year. Through one hundred games, they’ve scored 505 runs, good enough for second in the AL. They scored 726 runs in the 2012 regular season, making them just the first team above the AL average. They’re on pace to finish with 818 runs this year, nearly one hundred more than last year. While the above data confirms my feeling that the Tigers were having trouble scoring late in games– they didn’t score their first ninth-inning run until April 19— and therefore mounting comebacks, it also supports my derivative assertion, which is that Detroit’s problem is not just its bullpen, but the combination of a group of relief pitchers who can’t hold leads and a group of batters who can’t retake lost leads (or add insurance runs to help preserve leads). The bullpen likely will be the easiest to fix with a personnel move late this summer, but general manager Dave Dombrowski and company need to remember that this team’s main problem has multiple components. 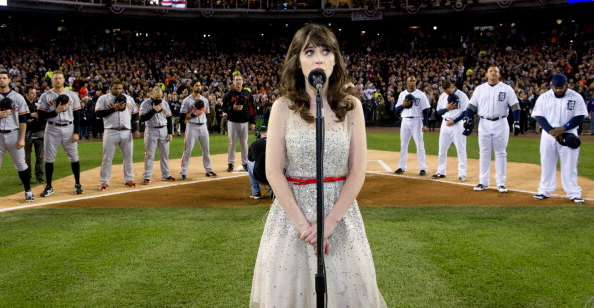 This entry was posted in ALDLAND and tagged baseball-reference, detroit, fangraphs, mlb, sabermetrics, sb nation, tigers, zooey deschanel by AD. Bookmark the permalink.